From left: Mohammad Fakrul Islam, Frederick MacDonnell, Wilaiwan Chanmanee and Brian Dennis, who all participated in the Proceedings of the National Academy of Sciences paper. MacDonnell and Dennis’ investigations also are focused on converting natural gas for use as high-grade diesel and jet fuel. 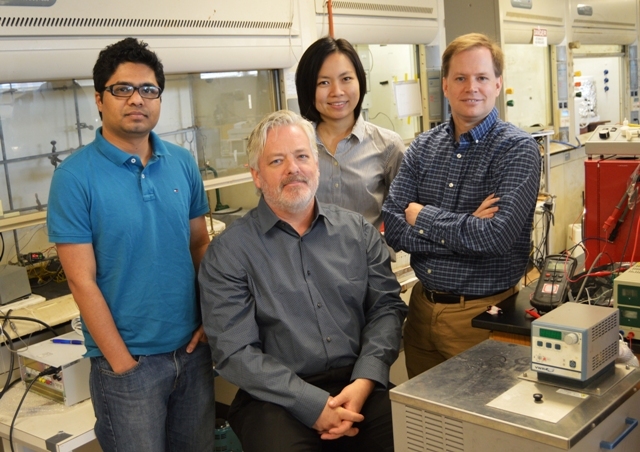 The researchers developed the gas-to-liquid technology in collaboration with an industrial partner in UTA’s Center for Renewable Energy and Science Technology, or CREST, lab, and are now working to commercialize the process. MacDonnell joined the College of Science in 1995, following his postdoctoral fellowship at Harvard. He earned his Ph.D. in inorganic chemistry from Northwestern University. Dennis joined the College of Engineering in 2004 as an assistant professor. He earned his Ph.D. in Aerospace Engineering at Pennsylvania State University and completed his postdoctoral work in Environmental Engineering at the University of Tokyo.